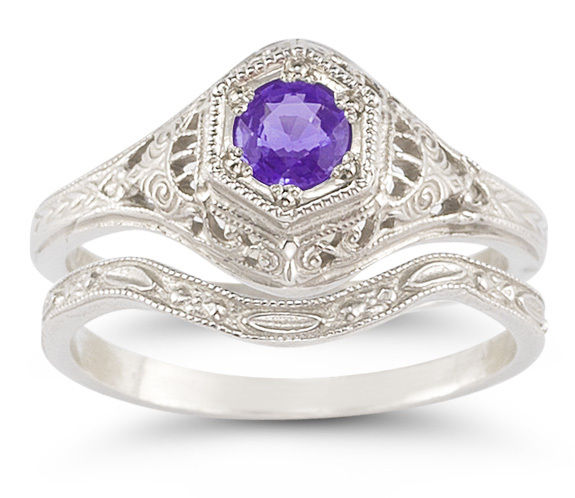 An antique-style genuine amethyst bridal wedding ring set made in solid 14k white gold. What makes this amethyst gemstone engagement and wedding band set stand apart from all the rest is that it is an exact reproduction of an 1800s bridal ring set. The ring's design is not just the artistic rendition of one of a jewelry designers, but we used the actual, authentic jewelry-making tools and hubs of the 1800s era to create this original, new bridal ring set. The purple amethyst gemstone measures 4.5mm round. Available in 14k or 18k white gold (please allow 7-10 business days for 18k). Also available in sterling silver, shown below. We guarantee our Antique-Style Amethyst Bridal Wedding Ring Set to be high quality, authentic jewelry, as described above.